When Hasbro saw the success then-rival Kenner was having with toys based on Star Wars, they decided to resurrect their old 12" army action figures in a new, 3¾" form. But they planned to copy more than those figures' size: no, in order to really conquer toy aisles, Hasbro thought, they'd need a backstory. Generic toys wouldn't cut it any more, and since GI Joe didn't have a movie franchise behind it, Hasbro turned to Marvel Comics to provide an original history. But the fact of the matter is, that story wasn't original. When a young writer named Larry Hama heard Hasbro was looking to revitalize the old military toys, he dusted off a proposal he'd handed in before. The original idea, "Fury Force" would have been about the son of Nick Fury leading an elite commando strike force to fight Hydra. Nick Fury Jr. became Hawk, his team became GI Joe, and their secret underground base became The Pit. Of course, since the book was no longer part of the mainstream Marvel Universe, they couldn't spend their time fighting Hydra - they'd need a new serpent-themed terrorist organization, and that's where Cobra came in. To celebrate their silver anniversary, Hasbro has created a special line of 3¾" figures that re-create the original characters, but offer 100% new sculpts. The 25th Anniversary Collection (TFAC) debuted with two boxed sets, featuring five classic Joe or Cobra figures. 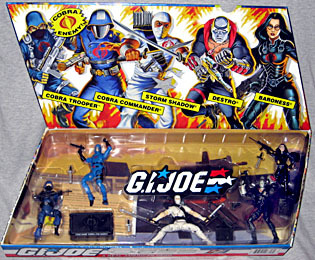 The Cobra set features a Cobra Trooper, Cobra Commander, Storm Shadow, Destro and the Baroness. One of the nameless, faceless legions of Cobra Command. Each Cobra is highly skilled in the use of explosives, all NATO and Warsaw Pact small arms, sabotage, and the martial arts. Qualified expert: Skorpion (VZOR61) Machine Pistol; Dragnov (SVD) Sniper's Rifles, Uzi Submachine Gun; M-16. This guy's filecard was always kind of screwed up. The 1982 figures already had the characters' specialties and code names reversed on the card, and the Trooper, here, (along with the Cobra Officer) listed his codename as "The Enemy," as though that was what we were supposed to call him. It always bugged me as a kid. It was even worse on Cobra Commander's card, since his codename was not, as you might expect, "Cobra Commander," but rather "Enemy Leader." Stupid. If ever there was an army builder in the GI Joe line, it's the Cobra Trooper. These generic, be-masked troopers made up the bulk of Cobra's forces, so they were all over the place in both the cartoon and the comic. 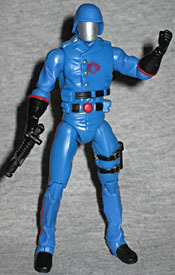 The figure is wearing a very detailed update of the classic Cobra uniform, a solid blue outfit with black boots, kneepads, belts and gloves, and red Cobra symbols on his chest and left arm. The knife strapped to his left leg was just a sculpted piece back in the day, but now it's an actual removeable accessory - and it's not the only one. His webgear can be taken off, and so can his helmet: both pieces that were originally firmly attached. In fact, the webgear takes a lot of visual elements from the original toy, like the small pistol on the right suspender and the pouches around the belt. Beneath the helmet, the Cobra Trooper is bald - is that because Cobra Troopers have to shave their heads, or is it because Hasbro didn't want to worry about the sculpt? His black facemask is stretched across his mouth and nose well, and he carries a black Dragunov sniper rifle in addition to the dagger - Cobra must buy Russian overstock. Absolute power! Total control of the world... its people, wealth, and resources - that's the objective of Cobra Commander. This fanatical leader rules with an iron fist. He demands total loyalty and allegiance. His main battle plan for world control relies on revolution and chaos. He personally led uprisings in the Middle East, Southeast Asia, and other trouble spots. Responsible for kidnapping scientists, businessmen, and military leaders, then forcing them to reveal their top level secrets. The Commander's field jacket buttons down the right side of his chest, rather than the center, but it's not quite as far to the right as the original's. By extension, that means the red Cobra symbol on his chest is smaller than you might like. His uniform is light blue, with red highlights. His gloves reach nearly to his elbows, which was a feature of the cartoon, not the old figure, but it's still a cool nod. The pouch strapped to his thigh is completely sculpted, and even the spat/stirrup things at the ends of his pants are fully sculpted and painted all the way under his shoes. Awesome! Cobra Commander's only real accessory is his black laser pistol, but it's just like the one he had back in the day - it even plugs into his back like that old one, though this time it does it with the pistol grip pointing the other way. His helmet is removeable, but that doesn't mean we get to see his face - just that the silver facemask wraps all the way around his head. 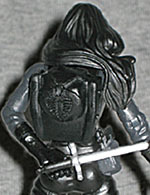 There are even some small technological connectors where the character's helmet would plug in place. But how does he take the thing off? There are no seams. Storm Shadow can trace his family history through thirty generations of ninjas. He can scale sheer walls with bare hands and feet, move with blinding speed, and endure unspeakable hardship and pain. Qualified expert: Long bow; Samurai sword; Throwing stars; Nunchaku sticks; 8th degree black belt in five martial arts. Storm Shadow may be the single most complex character in the GI Joe universe. When he debuted in 1984, he just seemed like an evil ninja (and that's what he was on the cartoon, too). But if you read the comics, you learned why he joined Cobra, what his goals were and where his real loyalties lay - and it was much more involved than just being an evil ninja. Once again, Larry Hama turned a cipher into a real character. 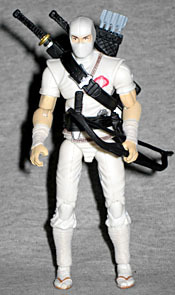 The Storm Shadow in this set is the original "white ninja" version, allowing you to have him training the Cobra troops. The detailing on his gi is very nice - again, it takes the classic elements and updates them. His "boots" are distinctively wraps around his shins, and he's wearing brown sandals with sculpted detail on the soles. The knife in his belt is removeable, supposedly, but it's such a tight fit that you may just leave it in place - the throwing stars are just sculpted elements. Storm Shadow's other weapons include a katana (long sword), wakizashi (short sword), a bow and a quiver full of (non-removable) arrows. Back in the day, he also had a pair of nunchucks, and the quiver opened to store them; not any more. The bow doesn't even attach today! The sash that holds the quivver and sheaths in place is a free-floating piece, and both it and the swords have the Arashikage symbol sculpted on them. 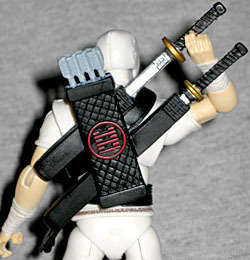 Sadly, however, the figure is missing the Arashikage clan tattoo on his right forearm: the original toy had wraps that ran all the way up to his elbows, thus believably obscuring it, but this figure's wraps stop mid-arm, and we should be able to see the top of it. Destro is the faceless power behind Military Armaments Research System, the largest manufacturer of state-of-the-art weaponry. To Destro, war is man's most natural state: the fittest survive and the greatest technological advances are made. He maintains a luxurious lifestyle around the world. Destro provides high-tech arms to any side able to meet his price and will incite war where it does not exist. He dons his silver battle mask (a family tradition) and enters battle himself, either with Cobra Command (Destro is their major weapons supplier) or against them if it's better for business. Destro was the first in a long line of unreliable Cobra agents - not because he was a coward, or lacked a sense of loyalty, but because he was more interested in his own goals than anything else, and wasn't above working against Cobra Commander if the price was right. That, coupled with his manly bare chest and shiny silver head, meant that even if he hadn't been a mainstay on the cartoon, he'd still be one of the most recognizable characters around. This Scots arms dealer is wearing his dark grey suit, silver mask and gloves. There are red grenades sculpted on his left gauntlet, and red missles sculpted on the right. 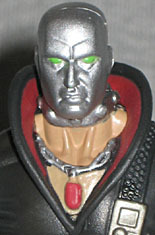 His collar and medallion are a seperate piece that fits over the figure's torso, and the fleshtone doesn't really match from that piece to the actual chest. Thankfully, though, hs head is just painted silver, rather than vac-metallized. As befitting a weapons merchant, Destro has tons of ordnance. In addition to what's sculpted on his arms, he has one small pistol that fits in the holster on his right leg, another small pistol that doesn't and a machine gun. Instead of a backpack, he has a M.A.R.S. 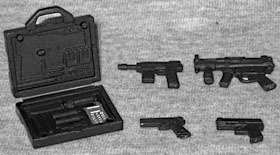 briefcase that opens to reveal a ton of sculpted weaponry... and a real removeable pistol. Nice! The guy is ready for anything - even if it must be hell going through airport security behind him. The spoiled offspring of wealthy European aristocrats, the Baroness graduated from student radicalism into international terrorism and finally into the ranks of Cobra. She was severely burned during a Cobra night attack operation and has had extensive plastic surgery. Rumor has it that she is the only one who knows the true identity of Destro. Qualified expert: M-16; AK-47; RPG7; Uzi; H.I.S.S. tank operator. While the Joe team got their token female in the initial series, it took Cobra two more years to recruit theirs. Baroness was generally looking out for herself, though she could usually be counted on to side with Destro - unless a better deal came along. Gotta love that self-interested sense of entitlement! The Baroness played a pretty big role in the GI Joe cartoon, since pretty much any woman who showed up in the story could eventually be expected to pull off a wig and mask to reveal it had been Baroness all along. Though if she could mask her voice that well for that long, why she normally spoke with such a strong Eurotrash accent is a mystery. The figure is a great update of the original, with more detail in the sculpt overall, and a cuter face. The paint is quite nice, as well, with gloss black for all the leather she wears, and a matte grey for the cloth she wears beneath. 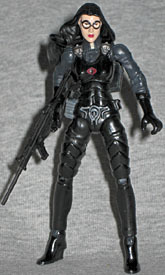 Baroness Anastasia Cisarovna comes with the same knife as the Cobra Trooper, a large black rifle (much more realistic than the laser gun the original toy had) and a Cobra backpack. The figure's long hair is swept to the side so it doesn't get the in the way of the backpack, so when that accessory isn't in place, her head has a really nice range of motion. The 25th Anniversary Collection sets come in angled boxes shaped like the classic GI Joe logo. Press the exposed button and you'll hear a few seconds of the original cartoon theme song. The front of the box flips open to show off the figures inside, and the back is a huge collage of images from the line's history. The figures themselves are in a lidded plastic tray, so you don't have to worry about twist ties - just Hasbro's weird predilection for those weird trays that have body parts sticking through to the back. In addition to all the accessories listed above, the set includes five black stands with the characters' names on the front, and individual filecards which feature new artwork purposely aping the originals (probably so Hasbro didn't have to find whoever did those old paintings and pay them again). 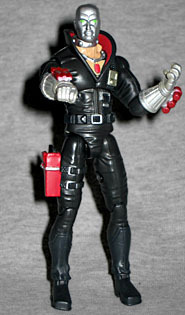 The Cobra set also has a packaging variation, with later shipments displaying the figures in a different configuration. Both versions, however, have the figures in front of a backdrop displaying the top of a Terror Drome. Surprisingly, the figures are a full 4" tall, not the expected 3¾". Less surprisingly, the articulation is excellent. All five figures feature balljointed heads, shoulders, elbows, chests, hips and ankles. No waists on any of them, but the torsos make up for it. The Trooper, Cobra Commander and Storm Shadow have double knees, while Destro's are single and the Baroness's are balljoints. All the figures feature swivel wrists, though the precise placement of the joint varies from person to person. The Cobra Trooper's left hip is a bit loose (and one of the clips that holds his knife in place broke, but that doesn't have to do with the articulation). After an absolutely awesome start, the GI Joe TFAC figures have really been keeping up the quality. Most of the figures in this set have just seen re-release in Series 4 of the individually carded figures - Hasbro's way of making sure everybody can get the figures they want. And that's not even counting the reused figures, like Hooded Cobra Commander. In fact, the Baroness is the only one from this set you cannot yet get in any other form, though that's soon to be rectified.